Click image to enlarge Snake River, upstream, as seen from Sacajawea State Park. From boat dock near "the point" at Sacajawea State Park, looking upstream Snake River. Image taken September 25, 2005. The Snake River originates in Yellowstone National Park, Wyoming, at 9,500 feet and winds through southern Idaho before turning north to form the boundary between Idaho and Oregon. 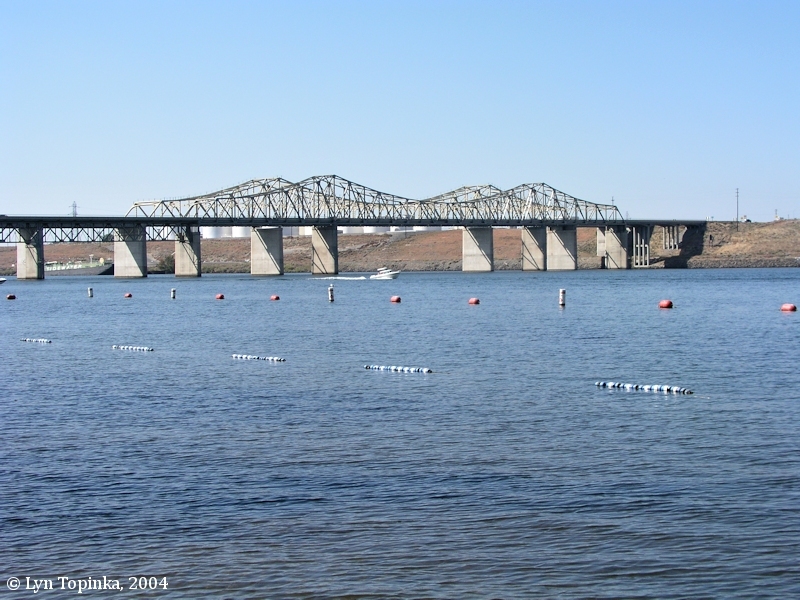 It joins the Columbia River at Columbia River Mile (RM) 325, near Pasco, Washington, at 340 feet in elevation and 1,036 miles from its source. The Snake River is the largest tributary of the Columbia River, with a total drainage area about the size of the State of Oregon. 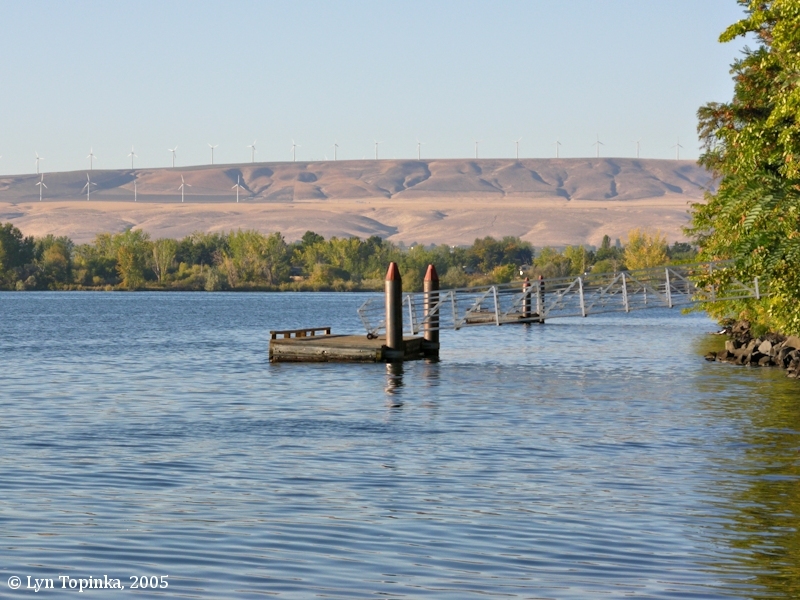 Lewis and Clark traveled down the Snake and reached the Columbia River on October 16, 1805. The men set up camp on a point where the Snake meets the Columbia, today the location of the Sacajawea State Park. The Lewis and Clark expedition arrived at the junction of the Snake River with the Columbia River on October 16, 1805. Here they set up camp at "a point" between the two rivers, today the location of Sacajawea State Park. They stayed at this location for 2 nights, leaving on the morning of the 18th for their journey down the Columbia. Click image to enlarge Lewis and Clark's first view of the great Columbia River. Columbia River as seen from the mouth of the Snake River, from the boat dock at "the point" of Sacajawea State Park. View is looking downstream on the Snake River, towards its confluence with the Columbia River. Image taken September 29, 2003. Initially Lewis and Clark called the Snake River "Lewis's River", after Captain Lewis. Their route map [Moulton, vol.1, map#75] depicts the Snake as "Lewis's River". In their journals however, they later switched to the Indian name of "Ki moo e nim" or "Kimooenim" River. On July 9, 1811, British explorer David Thompson reached the junction of the Snake River with the Columbia River and he erected a pole with a note proclaiming the area for the British. Thompson called the Snake the "Shawpatin River". "July 9th, Tuesday. A stormy night and morning. Wind northesterly. At 6:10 A.M. set off ... to the junction of the Shawpatin River with this, the Columbia. Here I erected a small pole with a half sheet of paper well tied about it, with these words on it: "Know hereby that this country is claimed by Great Britain as part of its territories, and that the N.W. Company of Merchants from Canada, finding the factory for this people inconvenient for them, do hereby intend to erect a factory in this place for the commerce of the country around. D. Thompson, Junction of the Shawpatin River with the Columbia. July 9th, 1811."" The river likely got the name "Snake River" from the first white explorers who misinterpreted the sign made by the Shoshone people -- who identified themselves in sign language by moving the hand in a swimming motion -- which appeared to these explorers to be a "snake". This sign in reality signified that they lived near the river with many fish. Charles Wilkes and the Exploring Expedition of 1841 showed the main stream of the Snake River as "Satin or Lewis River". The 1859 map, "Oregon State and Washington Territory," listed the drainage as "Lewis Fork or Snake River," but by 1865 the Washington Territory map had dropped all indications of the Lewis and Clark name for the river and established the name "Snake River". In 1912 the U.S. Board of Geographic Names made official the name the "Snake River". 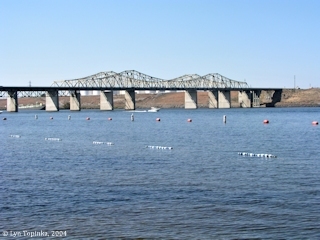 Linking Franklin and Walla Walla Counties, the Vaughn Hubbard Bridge between Pasco and Burbank carries Washington State Highway 12 (U.S. 12) across the Snake River. According to the "bridgehunter.com" website (2016), the westbound lanes (cantilever through truss bridge) were built in 1950 and rehabilitated in 1988, with a total length of 1,770.1 feet. 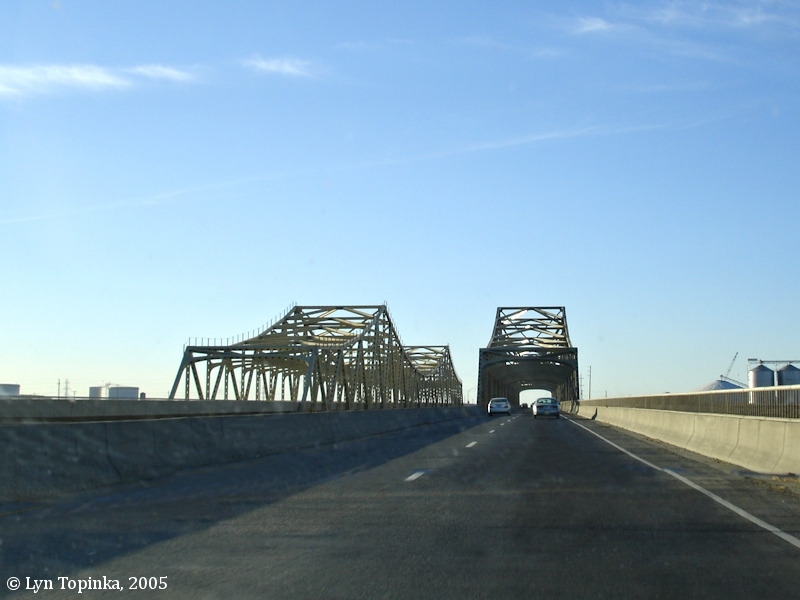 The eastbound lanes (cantilever through truss bridge) were built in 1986, with a total length of 1,779.9 feet. 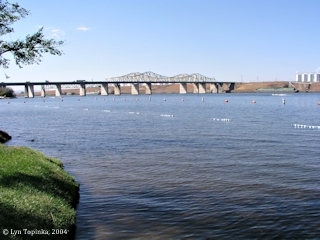 The first bridge crossing the Snake River near the mouth of the Columbia was built in 1921 and was known as the "Snake River Bridge at Burbank". This bridge replaced the existing ferry and carried a toll until 1927. It burned in September 1949. 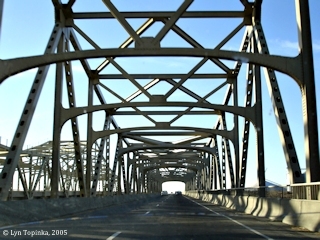 Click image to enlarge Crossing the Snake River, Washington State Highway 12 (U.S. 12), heading west. Heading towards Pasco. Image taken September 24, 2005. 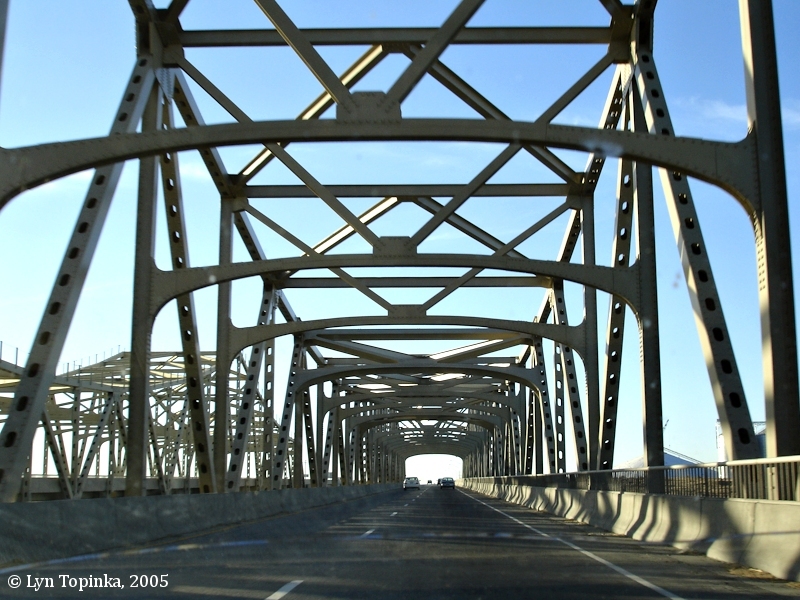 Click image to enlarge Crossing the Snake River, Washington State Highway 12 (U.S. 12), westbound. View from front car window while heading towards Pasco. Image taken September 24, 2005. Hood Park, Washington, is a 99-acre camping, boating, and day-use park, which is managed by the U.S. Corps of Engineers. 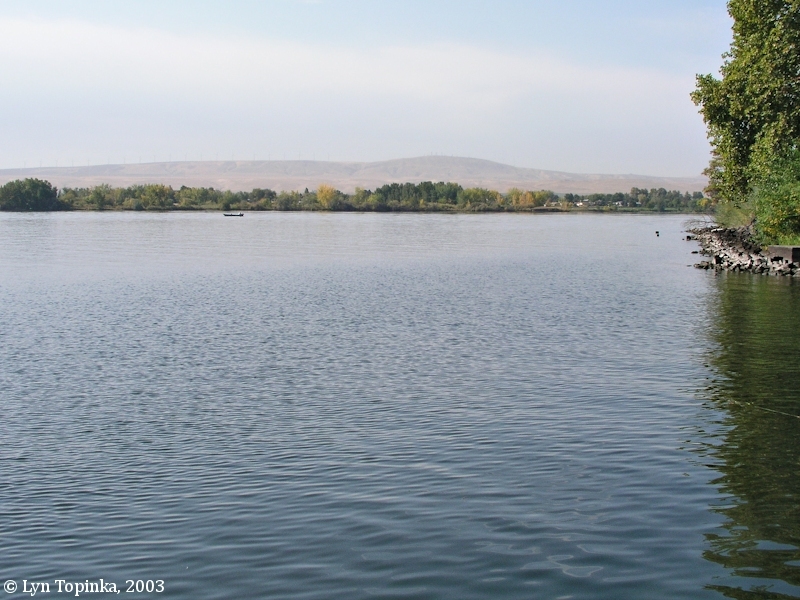 It is located 2.5 miles upstream from the confluence of the Snake with the Columbia, on the shore of Lake Wallula, the reservoir behind the McNary Dam. Lake Wallula extends 10 miles up the Snake to the Ice Harbor Dam. 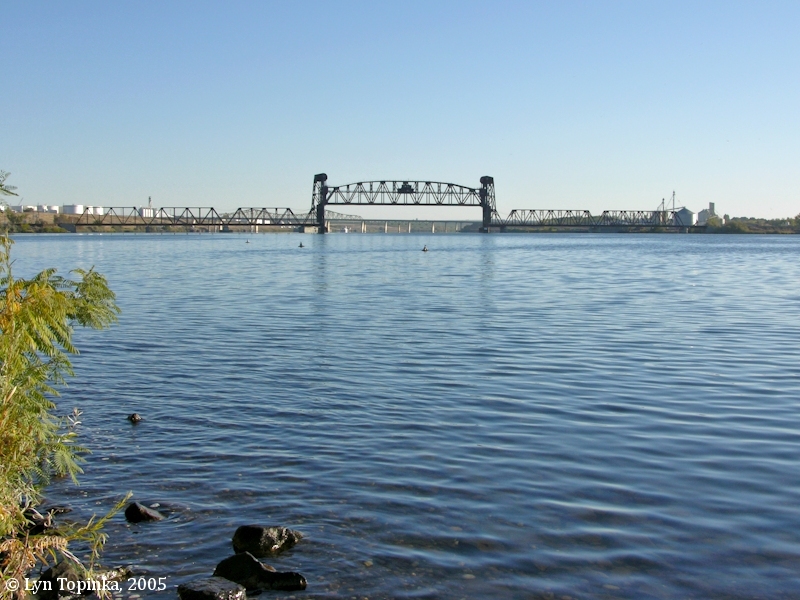 Downstream from Hood Park is the Vaughn Hubbard Bridge (U.S. 12). Click image to enlarge Snake River looking downstream from Hood Park. Image taken September 26, 2004. 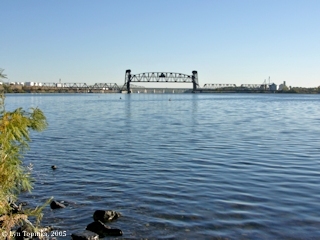 Click image to enlarge Snake River Bridge, from Hood Park. Image taken September 26, 2004. Click image to enlarge Penny Postcard: Snake River Bridge at Lewiston, Idaho, ca.1905. Penny Postcard, ca.1905, "Snake River Bridge at Lewiston, Idaho.". 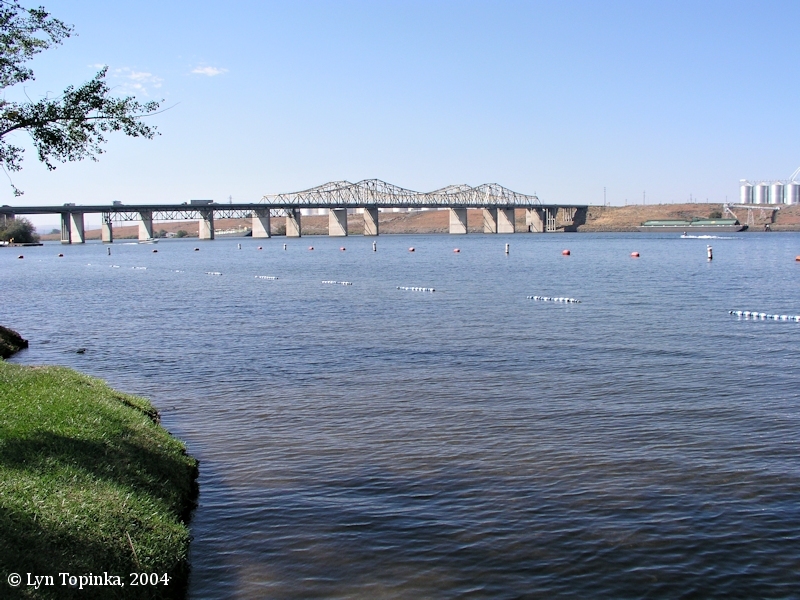 Lewiston, Idaho, and Clarkston, Washington, located at the confluence of the Clearwater River with the Snake River, were both named after Lewis and Clark. Published by Edw. H. Mitchell, San Francisco, for Thatcher & Kling. Undivided back. In the private collection of Lyn Topinka. Click image to enlarge Penny Postcard: Ferry, Snake River, Idaho, ca.1910. Penny Postcard, ca.1910, "Beautiful Idaho. Ferry on the Snake River.". Published by The Boughton-Robbins Co., Spokane, Wash. Card #38. In the private collection of Lyn Topinka. A cool morning deturmined to run the rapids, put our Indian guide in front our Small Canoe next and the other four following each other, the canoes all passed over Safe except the rear Canoe which run fast on a rock at the lower part of the Rapids, with the early assistance of the other Canoes & the Indians, who was extreamly ellert every thing was taken out and the Canoe got off without any enjorie further than the articles which it was loaded all wet. at 14 miles passed a bad rapid [Five-Mile Rapids] at which place we unloaded and made a portage of ¾ of a mile, haveing passd. 4 Smaller rapids, three Islands and the parts of a house above, I Saw Indians & Horses on the South Side below. ... after getting Safely over the rapid and haveing taken Diner Set out and proceeded on Seven miles to the junction of this river [Snake River] and the Columbia [Columbia River] which joins from the N. W. passd. a rapid two Islands and a graveley bare, and imediately in the mouth a rapid above an Island. In every direction from the junction of those rivers the Countrey is one Continued plain low and rises from the water gradually, except a range of high Countrey [Horse Heaven Hills] which runs from S. W & N E and is on the opposit Side about 2 miles distant from the Collumbia and keeping its derection S W untill it joins a S W. range of mountains [Blue Mountains]. We halted above the point [today the location of Sacajawea State Park] on the river Kimooenim [Snake River] to Smoke with the Indians who had collected there in great numbers to view us, ... after Smokeing with the Indians who had collected to view us we formed a camp at the point [today the location of Sacajawea State Park] near which place I Saw a fiew pieces of Drift wood after we had our camp fixed and fires made, a Chief came from their Camp which was about ¼ of a mile up the Columbia river at the head of about 200 men ... Great quantities of a kind of prickley pares, much worst than any I have before Seen of a tapering form and attach themselves by bunches. We had a fine morning and embarked early; proceeded on about 3 miles, when one of our canoes run upon some rocks in a rapid, but by unloading another canoe and sending it to her assistance, we got all safe to land, and then continued our voyage. About 1 o'clock we came to another rapid, where all hands carried a load of the baggage by land about a mile, and then took the canoes over the rapids, two at a time, and in that way we got them all down safe and proceeded on. Having gone 21 miles we arrived at the great Columbia river, which comes in from the northwest. We found here a number of natives, of whose nations we have not yet found out the names. We encamped on the point between the two rivers [today the location of Sacajawea State Park]. The country all round is level, rich and beautiful, but without timber. we Set out as usal and proceedd on over the rockey rapids one of the canoes run fast on a rock in a bad rapid and Stayed untill we went with a canoe to their assistance. got all Safe to land loaded and Set out again and proceeded on. in the afternoon we Came to the last bad rapid as the Indians Sign to us. we halted little above and carried Some of the baggage past by land abt. one mile then took the canoes Safe down and loaded them again and procd. on passed over Several rapid places in the River. towards evening we arived at the big forks [junction of the Snake River with the Columbia River] the large River which is wider than the Columbia River comes in from a northerly direction [actually the Columbia River]. the Country around these forks is level Smooth plain. no timber. not a tree to be Seen as far as our Eyes could extend. a fiew willows Scattering along the Shores. about 200 Savages are Camped on the point between the 2 rivers. we Camped near them [today the location of Sacajawea State Park].